A couple of weeks ago, my friend and social media junkie, Claudia Guzman, invited me to the up-coming OV7 concert at the Fillmore in San Francisco. You see, most bilingual-two-cultures-Mexican-peeps like Claudia and I grew up listening to both Backstreet Boys/NSync’ and Mexican pop bands like OV7 and Kabah. This tour marked OV7’s return to the stage after being apart for seven years. Between 1989 and 2003, OV7 was one of the most successful pop bands in Mexico; they have 12 albums, have toured all over the world and have sold over 5 million albums. The band made their triumphant return at the Fillmore in San Francisco- did fans know what to expect? Would there be lots of costume changes and choreography? Well, yes and yes! And I, being a fan, was very pleased! Lidia Ávila, Ari Borovoy, Erika Zaba, Oscar Schwebel, and Mariana Ochoa came on stage with so much energy and ready to put on one amazing show. They performed songs from their early hits like “Susanita Tiene Un Ratón”, “Quiero Salir De Vacaciones” , “Que Triste es el Primer Adiós” among others. 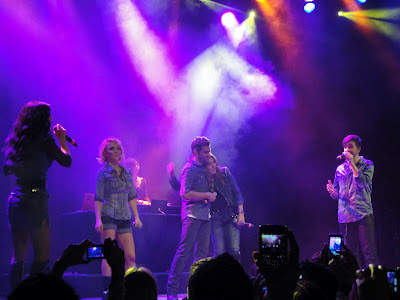 They also performed such hits as: “El Calendario”, “Mirame A Los Ojos” “No Me Voy” and during the song “Te Quiero Tanto Tanto”, the band brought fans on stage to sing along the song. All throughout the concert, the band kept signing autographs, shirts, bags, you name it, and it was signed. They randomly grabbed fans' cameras and took pictures and recorded videos. 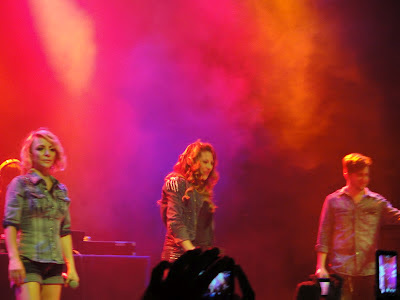 The show at the Fillmore was a little less than an hour and a half, it went by so quick and the fans were left wanting more.